A rare storm that tore through Arizona with baseball sized hail severely damaged a two-year old roof on an insurance company’s office building in the prestigious Scottsdale business district. In order to prevent tearing off and starting over, the customer chose the durable TRITOflex rubber membrane recover system to go over top the existing roof. The client only had their new laminate-surfaced, two-ply modified bitumen roofing system installed for two-years before a major hail storm severely damaged it, resulting in ripped seams, punctures and a fractured laminate surface. Although the hail strikes damaged the modified bitumen roof membrane, the underlying insulation was undamaged and could be salvaged. The client was presented with the two best options by the consultant, Alan Stevens Associates. The first option was to do what they had done two years prior and tear-off the entire modified system down to the concrete decking and start all over. 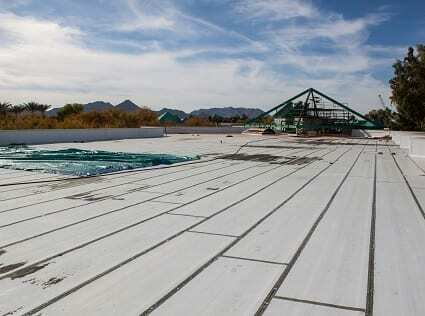 The second option was to have the roof recovered with the TRITOflex fluid-applied, instant-setting rubber membrane, which is hail-resistant, has no seams, and has the highest wind uplift rating in the industry. 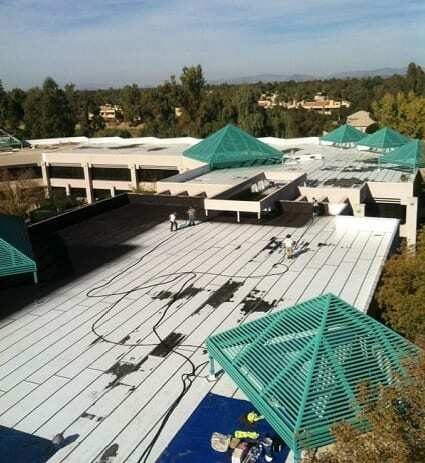 Rather than going through the cost, labor, and disruption of tearing off the entire roof system again, the client chose TRITOflex to be installed over the existing hail damaged membrane. The client achieved a new 15-year warranty and saved $500,000 over replacement cost.